The Rocky Mountain ATV MC WORCS Championship got back to business again following its summer break. 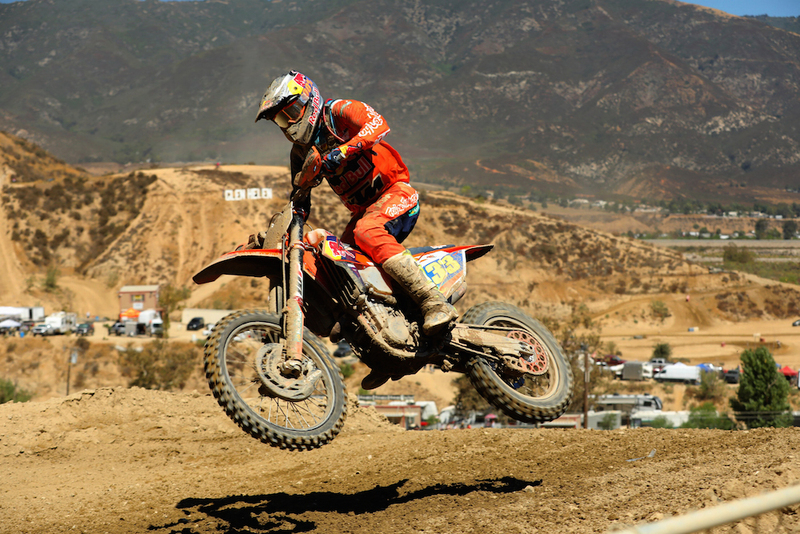 Racers were anxious to get racing again at Glen Helen Raceway, September 16-6, but probably none more so than Taylor Robert (FMF/KTM), who spent most of that time nursing a broken hand. But things started off shaky at Glen Helen for Robert when he crashed during practice on Friday, banging up the same hand he had previously injured. At the time, it was doubtful he was even going to compete in Sunday’s Pro race, but he bit the bullet, suited up and won! It wasn’t an easy win, however, as he first had to deal with Zach Bell (Husqvarna), who was also hungry for a win. Robert chased the early leader, Bell, the whole first lap before passing him on the second lap. From there, Robert kicked it into overdrive and took off, crossing the finish line approximately 30 seconds ahead of Bell. Trevor Stewart (Honda) circulated in third the whole race, never too far behind the Robert/Bell duo. Stewart finished the race there, approximately 15 seconds behind Bell. Fourth went to Italian Giacomo Redondi (KTM), while Eric Yorba (KTM) rounded out the top five overall. Defending champ Gary Sutherlin (Suzuki) was sixth overall. In the race for the 2018 WORCS championship, Redondi still leads the way, followed by Sutherlin 14 points back, 125-111. Bell is third with 109 points, followed by Robert, who sat out two rounds earlier in the season with an injury. He’s right there with 100 points. In Pro 2, Austin Walton (Husqvarna) took the win after passing early leader Benny Breck (Honda). Walton had control of the lead by the second lap and never looked back, taking the checkered flag 28 seconds ahead of his nearest class rival Tallon LaFountaine (Husqvarna), who started the race in fifth. Finishing right behind LaFountaine in third was Mitch Anderson (KTM). Austin Serpa (KTM) and Breck filled out the top five. In Pro 2 Lites, Victor Guerrero Ruiz (Yamaha) led every lap to take the win. He took the checkered flag well ahead of runner-up Robby Schott (KTM) and third-place Chance Fullerton (Beta). Trevor Hunter (KTM) and Nick Stover (KTM) rounded out the top five. In the Women’s Pro class, Brandy Richards (KTM) got around Lauren Woods (KTM) on the first lap and then rode off to victory, taking the checkered flag with more than two minutes to spare over Woods.